Gas station owner Ki Yun Jo's death in a gas-and-dash incident has left many in the small town of Thorsby, Alta. shaken. A prayer service will be held Wednesday evening at the town's community hall. 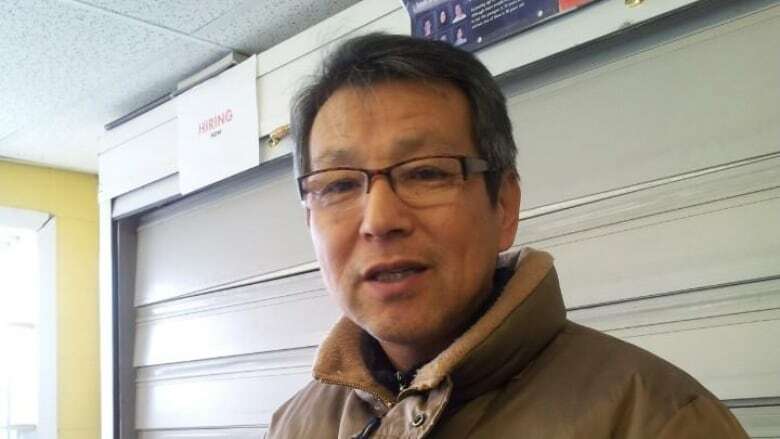 Gas station owner Ki Yun Jo's death has left many in the small town of Thorsby, Alta. shaken. The community of 1,000 people, 70 kilometres southwest of Edmonton, only has two gas stations. The Fas Gas location on 52nd Street was popular with locals, according to deputy mayor Lloyd Jardine. According to RCMP, the driver of a white commercial cube van sped away from the Fas Gas station without paying for fuel around 3:45 p.m. Friday. As the vehicle was leaving, Jo was killed while trying to get the driver's attention, police said. The van had been stolen earlier Friday in Spruce Grove. It has not been found. It has Middleton Flooring Ltd. written on its front and side. "It's very tragic," said Jardine, adding that Jo ran the Fas Gas location for over 12 years. "Everybody in Thorsby and the surrounding area knows Jo. We are going to have a prayer vigil for him tomorrow [Wednesday] night." The prayer service will start at 7 p.m. at the Thorsby community hall. RCMP will be on site beginning at 10 a.m. to provide counselling to anyone who needs it. Jo had a reputation for being generous and outgoing, sometimes even helping people pay for their gas if they couldn't afford it, according to Jardine. "The two ministers in town decided to get together with the councillors and they decided that we should have something for him," said Jardine. On Facebook, Jo's family has reached out to the community, starting a crowd-funding page to collect money to convert the existing gas pumps at the station to pre-paid pumps. "My father was a very hard-working man who gave up his life to provide a living for his family," wrote Jo's son, Sung Hyun Jo. The town council is now apparently pushing the province to implement gas-and-dash legislation. "The mayor and myself and another councillor, Bill Adams, went and talked to our MLA on Saturday — the day after — and we're going to take action to make the law about paying for you gas first," Jardine said. In British Columbia, all motorists are required to prepay for fuel. The law is commonly known as Grant's Law, named after a young gas station attendant killed in Maple Ridge in 2005 while trying to prevent a gas-and-dash robbery. The United Conservative Party released a statement Tuesday urging the NDP government to follow through on a 2015 commitment to introduce legislation targeting gas-and-dash crimes. Alberta Labour Minister Christina Gray said Sunday the government is working on policies that should better protect workers in the future, with more information expected later in the fall.